We have three areas of operation within our nursery, our Day Nursery, Pre-school and Manor House. Our Day Nursery caters for children aged 6 months to 2 years 11 months offering an ideal experience for young children. Children can explore and learn through a play based curriculum covering all areas of development. Children can attend a minimum of three sessions or full time depending on parental requirements. Our Pre-school caters for children who are rising 3 to 5 years. Children can attend a minimum of three sessions or full time depending on parental requirements. The children follow a full curriculum offering stimulating and fun learning experiences. Manor House also caters for children who are rising 3 to 5 years in preparation for entry to the grade one selective schools. Children must attend five sessions per week and commit to a two year teaching cycle. The teachers who oversee Manor House have early years education expertise. Learning experiences are based on child led interests, topics, practical activities and parental input. Within our Pre-school and Manor House we have installed the latest computer equipment including interactive whiteboards where children can expand and build on their technology skills. They have the opportunity to experience language, literacy and numeracy games. 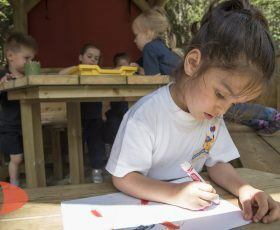 Children of all ages in all three sections follow the Early Years Foundation Stage Curriculum which very much centres on the individual child’s needs and interests. The framework covers the seven areas of learning: Communication and Language, Physical Development, Personal, Social and Emotional Development, Literacy, Mathematics, Understanding the World and Expressive Arts and Design. 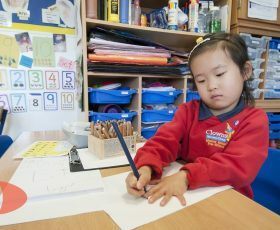 We aim for every child to leave nursery with self-confidence and a love of learning.